Sometimes fortune just smiles on you when you travel. Today was one of those days. 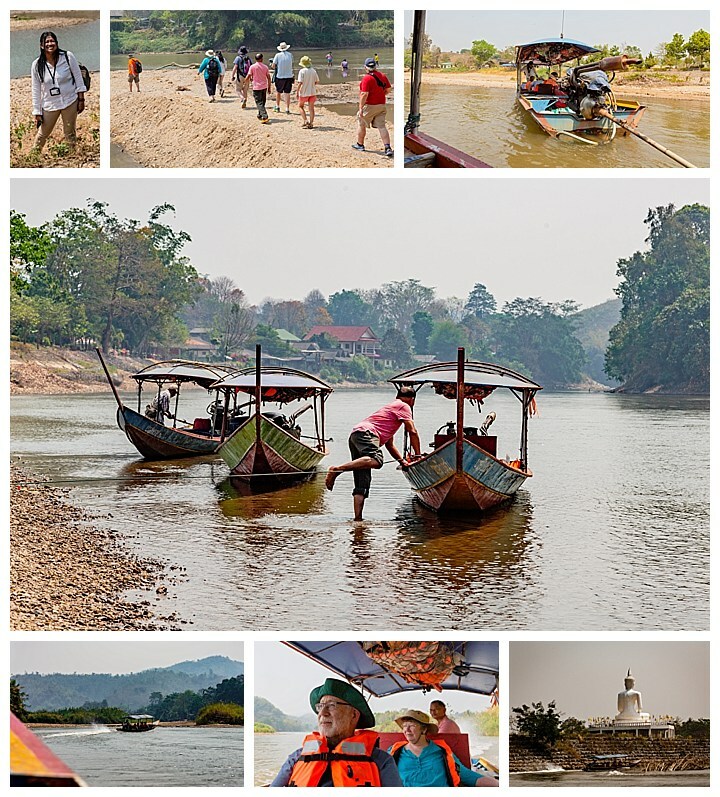 We had driven to a small town to pick up a long-tail boat for a ride down the river. 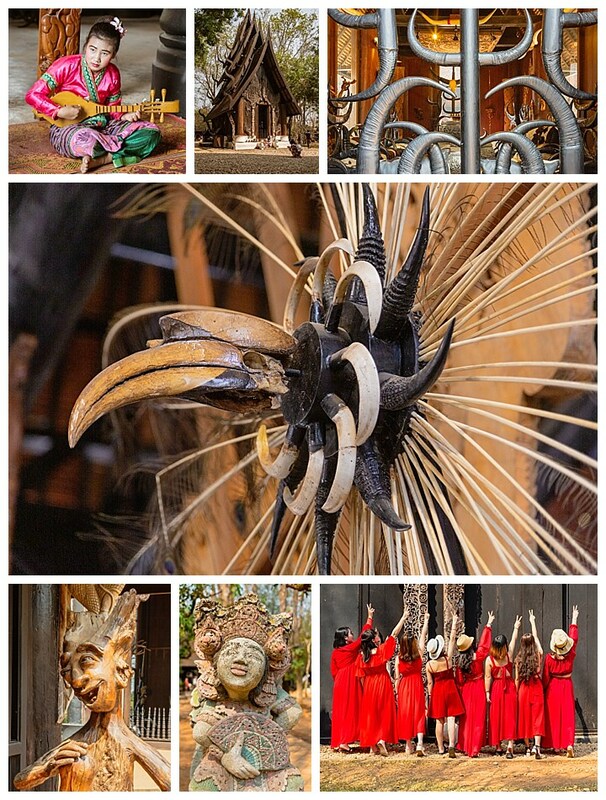 As we arrived, we discovered the village was about to start an “elephant feast.” Once a year the village puts together a long feast table piled high with bananas, watermelons, sugar cane, avocados and other treats and lets their working elephants gorge themselves. They are thanking the elephants for their year of hard work in the fields. As we arrived, four people were holding bamboo rods in a grid and banging them together, as villagers tried to dance among the banging rods. Most tried valiantly, but ended up with mangled feet as they missed a step and fell among the bamboo trap. Finally, two young women who clearly knew what they were doing, stepped in and danced together elegantly among the chopping bamboo, to the cheers of the watching crowd (upper-left). Roughly 20 elephants were then led in to stand around the buffet table. At a command, they all reached for the table of food with their trunks and started to feast. After a couple minutes, the villagers were allowed to come into the compound and feed the elephants (middle). 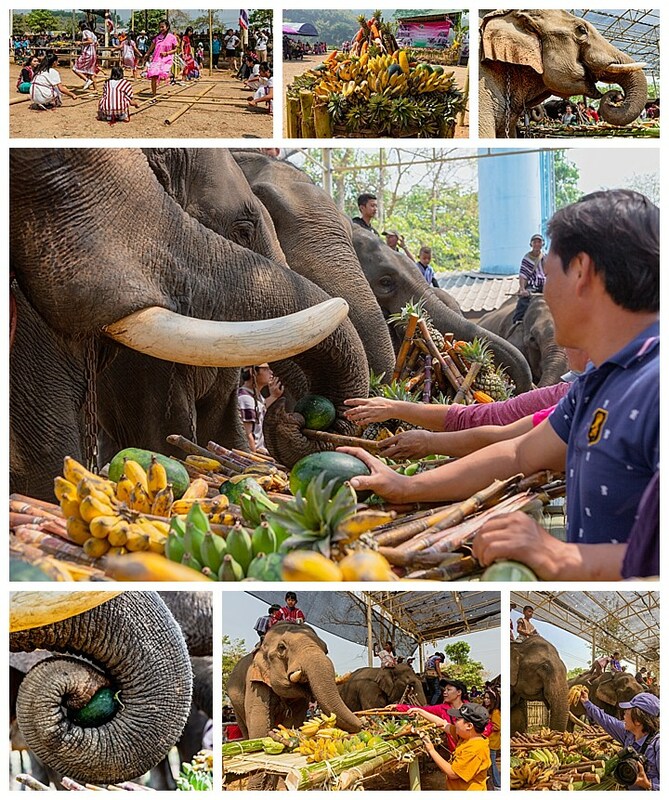 Evelyn even got into the act, feeding “her” elephant sugar cane and then a bunch of bananas (lower-right photo by Wi). After the festivities were over, we boarded two long-tail boats and rode down the river for half an hour. 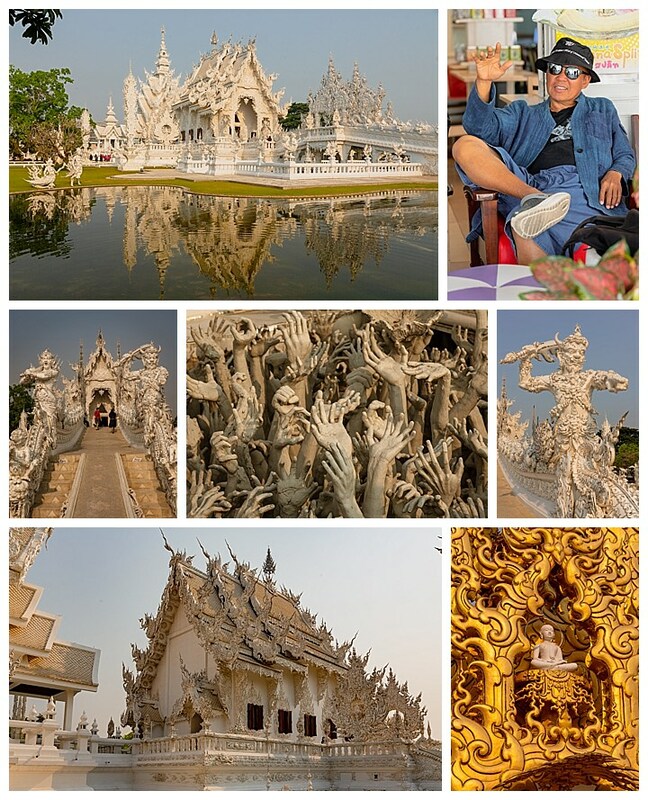 Chiang Rai has three famous “art temples,” of which we visited two. These are not really religious Wats, but rather temples and museums surrounding an artist’s vision. The first we visited was the Black Temple. Baan Dam Museum is a collection of 40 wood buildings featuring works by the artist Thawan Duchanee. This art temple is also known as “hell”. There are skulls of numerous animal species, skins of alligators and others, antique guns on walls, etc. There was one group of approximately 20 young Chinese women all dressed in red that seemed to be celebrating a university graduation together. Their vivid red dresses provided a nice foreground to the otherwise dark scenes (lower-right). The next day, we visited the White Temple, known by locals as “heaven”. 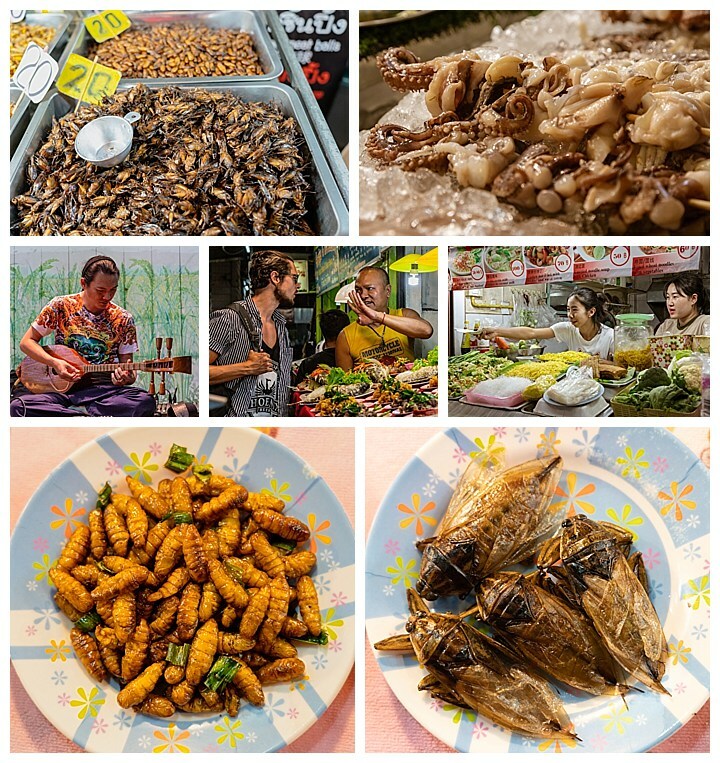 Another artist from Chiang Rai, Chalermchai Kositpipat (top right), dedicated him self to create art with a different vision and funded the project with his own money. He wanted to create art that people would remember and talk about. He started his project 20 years ago, and, says that he expects the project to take another 50 years to complete. The artist himself is on site most days, and is very approachable. Be sure get here early in the morning before the tourists show up. When first entering the grounds, you pass over a small bridge and look down into what is obviously a depiction of Dante’s Inferno (center). As you wander the grounds, the buildings are all extremely elaborate and ornate, harking back to the level of detail normally associated with the Middle Ages. 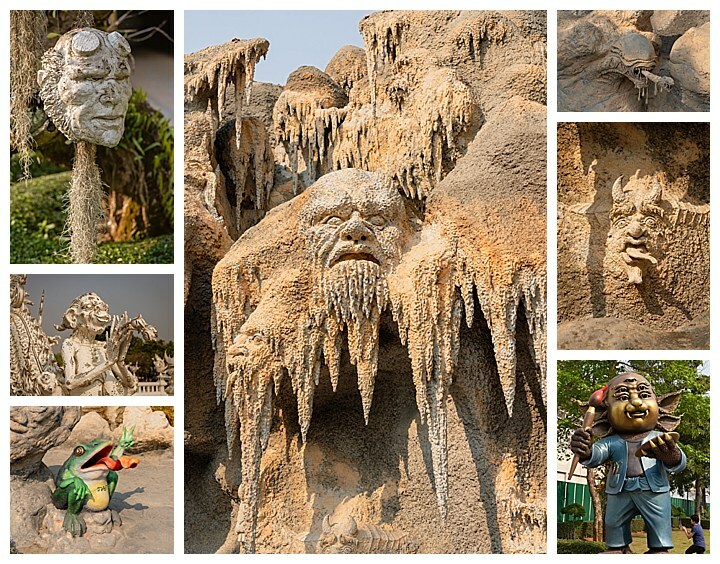 Walk around the grounds and look closely at the various statues, including those emerging from the walls, and you begin to wonder if you have tripped into Universal Studios. You will see statues of the Teenage Mutant Turtles, the alien coming out of a stomach, Marvel Comic heroes, the Terminator (with half his face missing, from the final scene in the movie when he was chasing the hero through the machine shop), and dozens of others.